Changes to Part L – is carbon neutral possible for 2016? | BSRIA Blog - Opinions and insights from BSRIA Limited. ← When will the lights go out? Changes to Part L – is carbon neutral possible for 2016? 2006 was a big year for building energy efficiency, the European Energy Performance of Buildings Directive started to be implemented. 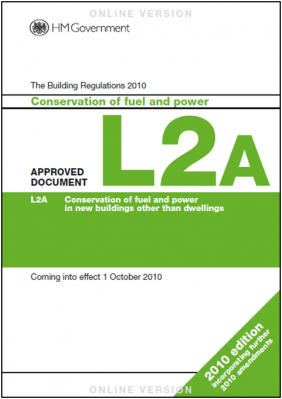 This triggered a radically new Part L, requiring all new building designs to meet CO2 emissions targets. The Code for Sustainable Homes was launched that year, and the government made bold plans to require new dwellings to be carbon neutral by 2016, non-dwellings three years later. A glide-path to zero carbon was published with interim Part L changes planned for 2010 and 2013. Come 2010, and the first round changes took place, with a 25% reduction in CO2 targets. Then the following year, the government (now a conservative-led government claiming to be the greenest ever) watered down the definition of zero carbon to exclude appliances and cooking. Fair enough, absolute zero carbon perhaps wasn’t a feasible target anyway. Fast forward to August 2013, and the second round of changes still hasn’t happened. The government has indicated that there will be a meagre reduction of 6% in CO2 targets for dwellings, and 9% for non-dwellings, and that these will kick in in April 2014. What this says to me is that the government, at the moment, aren’t all that interested in being green. Also, that 2016 is going to be very painful for housebuilders, who will have to make a huge leap to zero carbon. This zero-carbon commitment is still in place, and was even reaffirmed in the budget announcement in March. But of course, there’s another general election before 2016…. One Response to Changes to Part L – is carbon neutral possible for 2016? I may have missed something but has anyone produced a definition of “zero carbon”? It clearly cannot mean what it appears to say unless we go back to the dark ages or drape our buildings with inefficient & expensive (because of the small scale) high tech gubbins and forget about embedded carbon. Or are we supposed to fudge it and keep warm by leaving the cooker on with the door open?